After another sold out party, Luminosity returns on Saturday June 15th with a special one! 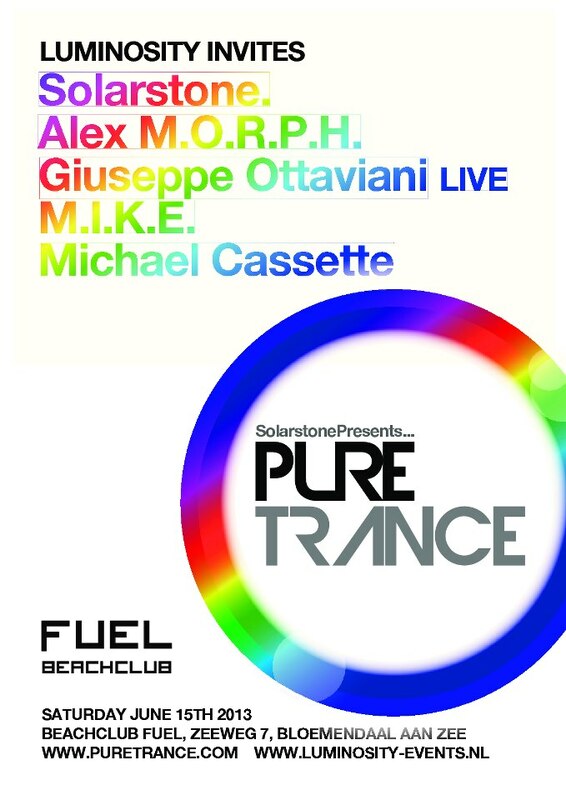 Together with Solarstone we present a PURE TRANCE night at Beachclub Fuel, Bloemendaal! This special Pure Trance event will showcase the true sound of trance which we stand for. “Pure Trance is a feeling, a passion which exists outside of contemporary musical fads and fashions. It is the bringing together of millions of fans for whom this music is a way of life Whether you've been into trance for 12 months or 20 years. ,,when you hear Pure Trance, you’ll know it… and you’ll feel it!” Solarstone. Organised by Luminosity Events on Saturday June 15th , Beachclub Fuel in Bloemendaal aan Zee (NL) will be the place to be for those who would like to enjoy the sound of Pure Trance. It's a welcome return for Solarstone, the man behind the global Pure Trance movement. He will be joined on the line up by German trance heavyweight Alex M.O.R.PH, Italian live virtuoso Giuseppe Ottaviani, the legendary M.I.K.E. and Finnish progressive talent Michael Cassette; from 2pm till 11pm they will take the audience on a 9hr long journey of trance in its purest form at Beachclub Fuel. Tickets for Luminosity invites: Solarstone pres. Pure Trance @ Beachclub Fuel are now available at € 25,- via Timoco.